» Paint Star Fundraiser A Success! home news & events Paint Star Fundraiser A Success! Thanks to you…our Paint Star Fundraiser was a great success! 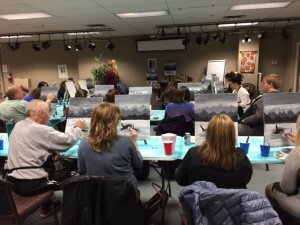 Painting, sipping, snacking, great fun, and a work of art to take home! Thanks to everyone who came out in support of RMACL Child and Youth Groups and learned to paint a serene orca whale picture. Thirty one guests and a handful of volunteers made this event a big success. Many local companies and individuals donated products and services for our silent auction so a few attendees left carrying gift baskets and gift cards. This entry was posted in Community Events, Front Page News. Bookmark the permalink.